A luxury Vancouver real estate development is launching right now! Introducing the Highbury Residences in Vancouver’s West Point Grey community where you can have the luxury of being able to walk everywhere! This enviable Westside Vancouver location is close to beautiful beaches, lush rainforests, urban parks, tennis and yacht clubs, eateries, world class dining, shops, boutique retailers, transit and golf courses. 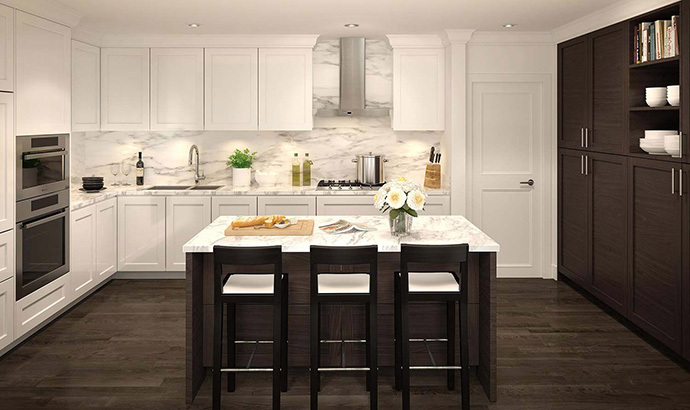 The West Point Grey Vancouver Highbury Residences is also a boutique condo project featuring only 6 exclusive homes for sale. Plus, there are three vibrant commercial districts within walking distance from your front door: West Broadway, West 10th and West 4th. For those who seek 1 level living (so you aren’t going up and down stairs all of your life! 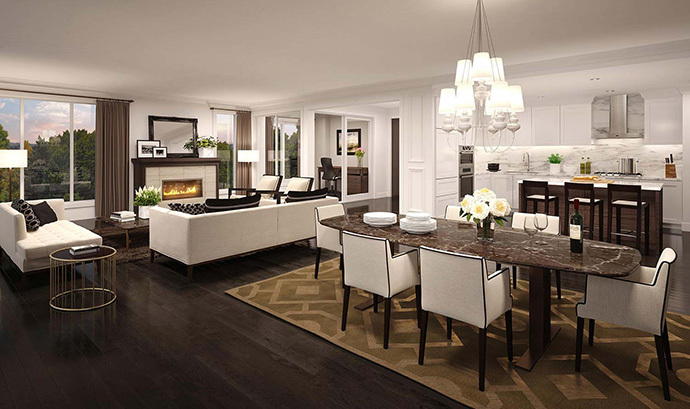 ), the Highbury Residences in Vancouver West Point Grey district will offer freedom and flexibility. Just steps away from the top ranked schools in Vancouver as well as local services, the flexibility of living at the Point Grey Vancouver Westside condos is unparalleled and you certainly won’t find anything comparable to this project. All 6 luxury homes offer prestigious living spaces on one level and there are only 2 homes per floor, making it ultra exclusive for any home buyer. 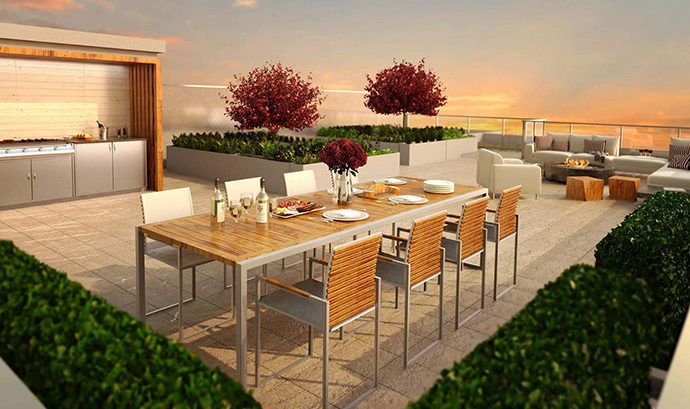 The spacious and open concept floor plans will also open onto very large gardens and rooftop decks. The Point Grey Highbury Residences in Vancouver will give you everything that you need within an arms’ reach. Read more about this prestigious condo project below or you can click through to their marketing web site at www.highburyliving.ca. They are priced from $1,988,000. Of you are looking for the most outstanding condominium in the heart of Westside Vancouver, the Highbury Residences in Point Grey will certainly fit the bill. The vision of the developer and interior design team at Highbury Residences was to create an architectural and modern landmark yet keep it’s timeless appeal for generations. The steel glazed entryway marks a prestigious address on a tree lined and established street within a traditional community. Black metal details and accents with elegant stone façade as well as expansive windows are signature design elements at the Highbury Residences Vancouver luxury homes. 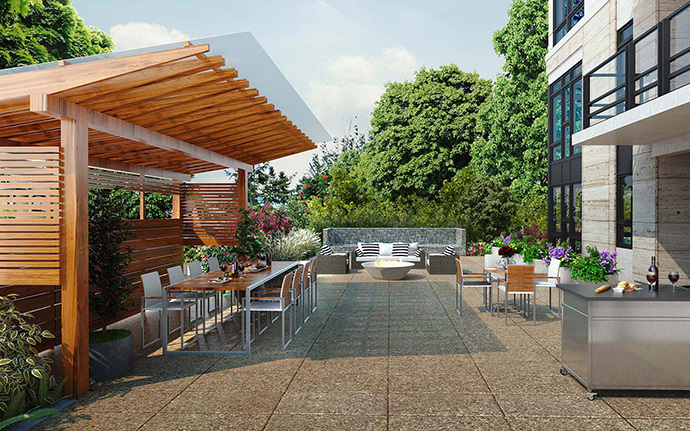 As well, these West Point Grey condos will have rooftop greenscaping, inspired by the beautiful setting, completing the energy efficient design. Another very unique feature of the floor plans that’s not seen anywhere else in the Westside Vancouver district are the expansive gardens PLUS rooftop decks, creating more outside entertainment and relaxation spaces for home owners to enjoy year round. It’s a natural extension from your beautiful interior living space and the functional accordion folding doors are both minimalist and streamlined so that seamless indoor and outdoor living is made possible. The Westside Vancouver Highbury Residences Penthouse suite decks are over 1,000 square feet in size and will overlook a lush green roof. Another main floor residence will have a beautiful contemporary garden with a calming water feature. The refined interior design features are both elegant as they are modern. Open concept layouts, high ceilings with over height ceilings, magnificent hardwood floors and exquisite detailing are signature features here. In addition, there are marble entrances, limestone tiled gas fireplaces and premium European appliances in the kitchen. 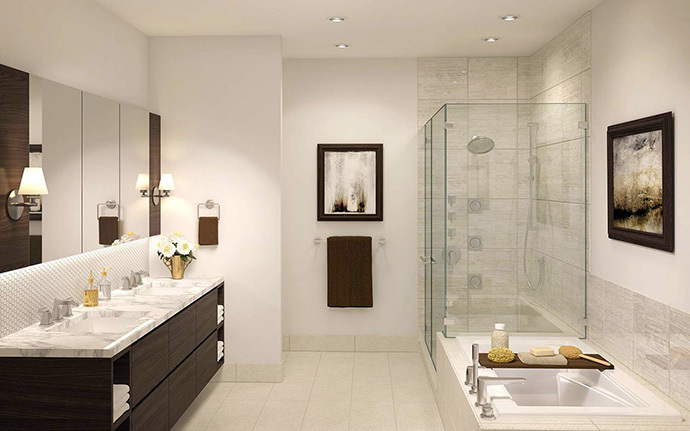 The West Point Grey Highbury Residences Vancouver condos will also feature 3 full sized bedrooms plus a flex room. 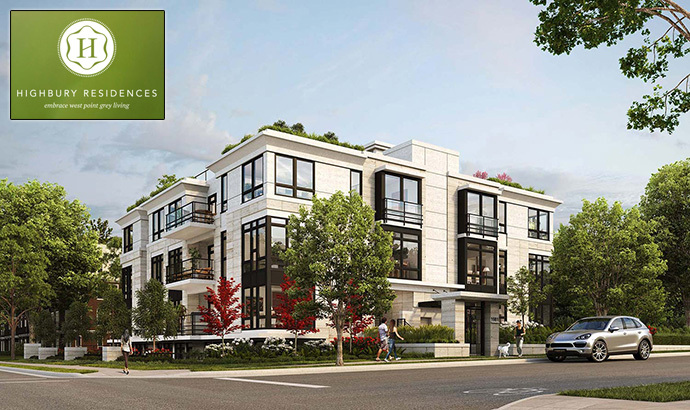 Six exclusive Vancouver Westside residences starting from 2,200 square feet are coming to West Point Grey real estate market in Fall 2013! Coming soon to this prestigious neighbourhood is a boutique collection of homes with clever use of wood, glass and metal to reflect the unique beauty of pure West Coast contemporary architecture. 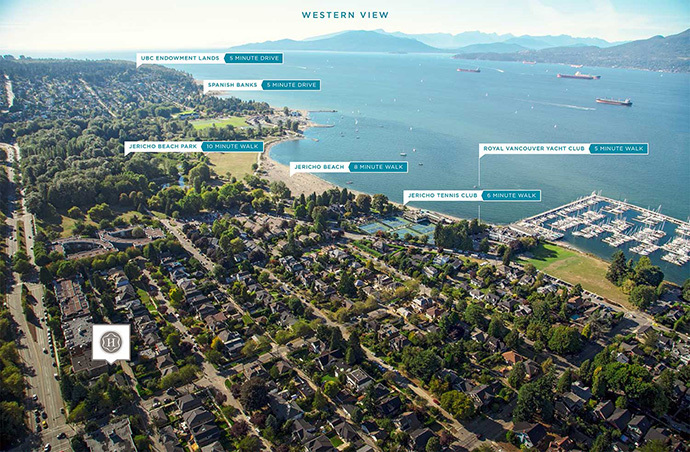 The project site for the West Point Grey Vancouver Highbury Residences is at 4th Avenue and Highbury. Six luxury boutique condominiums will be introduced to Vancouver’s prestigious West Point Grey neighborhood by South Street Development Group. This unique project will signify the true definition of West Coast Contemporary architecture through the sculpted use of wood, glass and metal. Only a privileged few will have the opportunity to own one of these exclusive units in this Point Grey masterpiece. The project team consists of South Street Development Group, Integra Architecture, Urban One Builders, I.D. Lab and Jonathan Losee Landscape Architect.